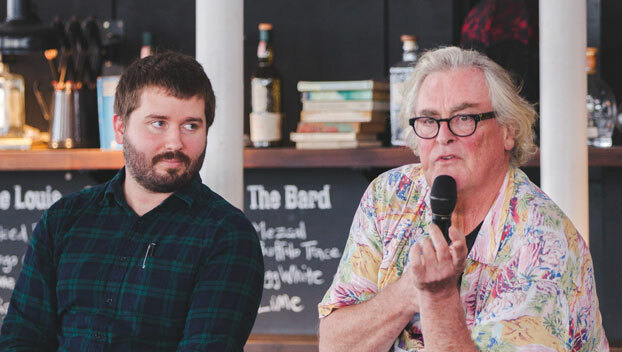 At a recent Pier Group Lunch, our Executive Director Patrick McIntyre joined Resident Director Kip Williams and actor John Howard to discuss Arthur Miller’s All My Sons. Patrick McIntyre: Kip, can you tell us a bit about the story and characters? Kip Williams: Lurking underneath the play is a knotted history between two families – the Kellers and the Deevers. Joe Keller and Steve Deever were business partners. Now, Steve is in prison because of his role in selling faulty airplane parts three years earlier during the Second World War and his family has been torn apart. Next door, Joe, has been cleared of any involvement in the crime. Meanwhile, one of his two sons has been missing in action for the last three years. Without wanting to give too much away, the truth about what happened three years ago is revealed over the course of the play. It really speaks to one of the great preoccupations of Miller, which is this idea of truth. It's interesting to note that, in the middle of the 20th century, the other major playwright in America, Tennessee Williams, was also interested in the idea of truth. But, unlike Williams, who was more interested in questions of personal truth, Miller is interested in a grander philosophical notion of truth – idealism versus pragmatism. The tension between ideals and pragmatism is the driving force inside All My Sons. What is true? What does the truth cost us? And how are families, communities and nations held together by lies and a 'performance' of truth that is played out complicitly and collectively? Patrick: The period after the war is often thought of as a prosperous boom time in America. Is All My Sons challenging that idea? Kip: Yes and no. In 1946, when the play is set, there was a swathe of American servicemen who returned to a country that didn’t fully understand what they had endured on the war front. That trauma is expressed clearly in the relationship between Chris Keller and his father Joe. But, yes, there was also economic prosperity for America in the middle of the 20th century – they did pretty well out of the war; not only because the industry created to keep up the war effort adapted to a consumer economy, but also because of the loans to European nations. That prosperity only sharpens the questions that Miller is asking. What are people pretending is not happening? What is the benefit of maintaining the status quo? Patrick: John, you’re playing Joe Keller in this production. Are you using local or American accents? Will it be set in the 1940s? How are you finding your way into the play? John Howard: It's firmly set in 1946. From the clues we have from the script itself, we’ve agreed that it's set somewhere in Michigan, probably near Ann Arbor or somewhere like that. Those two things are settled, and now it's a question of us being able to represent that properly. For the accent, you might know the filmmaker Michael Moore who’s from Flint, Michigan – that’ll be the kind of accent I'll be doing. As to getting into the play, one of the main issues that Miller talks about is how we are responsible for our actions. In All My Sons, a crime has been committed by Joe Keller and it comes back to roost through his sons, his wife and the small town they live in. It’s also about the relationship between father and son, and loyalty between family members. Actually, we were just talking about the influence of the playwright Henrik Ibsen on Arthur Miller. Miller was fascinated with Ibsen because of the way he could bring the history of his characters onstage. The past has dramatic repercussions in the present. That's very important in this play. What's happened before creates the situation that unfolds over the 24 hours in which the play's action takes place. The sense of responsibility and the sense of having to pay, one way or the other, for our actions is the centre of All My Sons. Patrick: Kip, can you talk about the design of the production? Kip: I’m working again with designer Alice Babidge and we’ve talked a lot about how we can render these characters as ‘heightenedly real’. We want them to have an immediacy. We want the audience to feel like the events are happening for them now, in reality, and not through the distance of memory. After all, Miller's audience saw the play as a direct reflection of their times. But Miller isn't simply televisual in the way he writes. The influence of Greek drama is very present inside All My Sons as well – there are echoes of Ibsen but also Sophocles. It's particularly Sophoclean to explore the relationship between father and son, and to have a structure revolving around a person who has committed an immoral act and must pay for it with their life. There is an operatic quality to this tragedy. As such, the space, particularly staging it in the Roslyn Packer Theatre, requires a response that matches this sense of the epic inside the play. And so there are two things happening in the design… The costumes are period and historically accurate, the actors’ performances are rendered with naturalistic detail, their voices reflect the accent of the 1940s. But the space itself is one that has a slightly abstracted quality to it, and whilst the set is that of a house and backyard, the way in which that home evolves across the show has a coupling to the way Miller’s writing opens up to become more expressive. By the end of the show, the stakes have risen so much that we really do feel like we are inside this great operatic piece. Patrick: How closely are you adhering to the text? Kip: Like Williams, Samuel Beckett or Caryl Churchill, Miller is a deeply musical writer. The great writers are great writers because they're like composers; they have a music that comes from within them. If directors or theatre makers don't start by trying to engaging with the music inside the writer, then they're missing the offering that's been given. In our first week, we’ve even been adhering to the stage directions religiously, which I don't always do, but Miller's music is so deeply tied to action, they need to be explored. John: The directions are there to allow us into the writer's intention. I have no problem with people freely adapting a story – that's a different kettle of fish. I do have a problem with people chopping up a writer's work that's perfectly good. Kip: You're always going to gain and lose some things based on the choices that you make. I think good art comes from freedom, but I also think restrictions can produce good work. I would always start with responding to what the writer has offered in the first place and grow the work from there – either in simpatico with it or in response to it. Pier Group lunches are one of STC's range of Insight events that allow you to get closer to our work and the people who create it. Everyone is welcome – find out more.